As we get older, mobility gets difficult. And climbing stairs in the worst because not only is it hard but you could possibly fall. Lift chairs for seniors can make taking stairs a breeze. Senior lift chairs come in all different styles and sizes so make sure you get the perfect one. For more than two decades, power lift chairs have helped senior citizens and people with physical challenges to get in and out of a chair safely and as pain-free as possible. Resembling a regular recliner, modern lift chairs are made with a powerful motor in the chair base that is powered by electricity. The movement of the chair is controlled by a remote control. When a person activates the remote, the chair lifts off its base and moves slowly rising into the air in a tilted forward arcing motion. If the senior was seated in the chair, the upward arcing motion makes it much easier to stand up, as the chair gently moves up and out. If the senior is standing and wants to sit in the chair, activating the remote brings the chair up and arced forward making it easy for the senior to lean on the chair as it gently guides him or her into a seated position. Once the senior is seated, the lift chair becomes a motorized recliner. Using the remote control, the chair moves into different reclining positions. Most models of lift chairs come with a battery back-up system so the chair remains operable in the event of an electrical power failure. There are three different types of power lift chairs: two position, three position and infinite position. 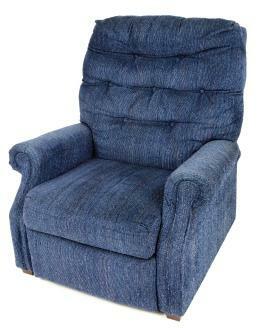 Often called TV recliners, two position lift chairs recline to approximately a 45-degree angle. Although the maximum reclining angle of these chairs is very comfortable for reading or watching television, they are not as comfortable for sleeping since they do not recline fully. Examples of a two position lift chair are the Pride C-10 lift chair and the Golden Capri lift chair. Three position lift chairs do not fully recline. However, they recline further back than a two position chair, reaching a position that is comfortable for napping. Examples of three position lift chairs are the Pride CL-105 lift chair and the Golden Monarch lift chair. A heavy duty three position chair is the Golden PR-502 Big Boy with the capability of lifting 700 pounds. The Big Boy has three motors. On an infinite position lift chair, the foot rest on the back rest each have their own motor allowing them to be controlled completely separately. Many models of infinite position lift chairs include extra options such as a massaging feature or heat. These features not only provide senior citizens with extra comfort, they help increase the user's blood flow. Many infinite position lift chairs fully recline into the Trendelenburg position. This position raises the user's feet above their heart. The Trendelenburg position is often recommended by medical professionals as a preventative measure against low blood pressure, or hypotension. It also relieves pressure on the lower back and aids in circulation. Examples of Infinite position lift chairs are the Pride LL770 lift chair and the Golden Maxi Comfort lift chair. When it comes to power lift chairs, it is important to match the correct chair size to the individual. If possible, it is always a good idea to visit a medical supply center or showroom to "try out" the fit of a specific style or model lift chair. However, in many cases this is not possible. The cost of lift chairs for senior citizens are often covered by their Medicare health insurance or their supplemental insurance plans.